Hello all! Today we continue our look back at the year, focusing this time on Before & After Projects! And don’t forget, we’ll wrap up our 2011 Year In Review link parties tomorrow with Room Makeovers. As much as I enjoy a great DIY project, where I take the raw materials and turn it into something useful and attractive, I have to admit that I prefer before and after projects. At least for me, there’s just nothing quite as rewarding as finding a diamond-in-the-rough in a thrift store or at a yard sale, imagining the potential, and then giving it a dramatic makeover. 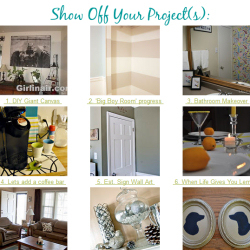 In fact, I like before & after projects so much that I had a very hard time narrowing down my favorite of the year!! So here are my favorite before and after projects of 2011. Okay, I know I cheated by showing not one, not two, but three before and after projects. Like I said, before and after projects are my favorite!! I find it so difficult to narrow it down to just one favorite. But now it’s your turn! Show us your favorite (or favorite two) before and after project of 2011. And again, please resist any urge you may feel to shamelessly promote your blog by linking up every single project you’ve done this year. 🙂 Just one or two of your favorite before and after projects, please! Thanks! Kristi, what a very fun idea for a wrap up of 2011! I love seeing “the best of”. Your dresser to media console is one of my all time favorites. Definitely want to try this in 2012. Thanks for hosting the party!